Top 10 reasons we love working at KaBOOM! Today, The NonProfit Times named KaBOOM! one of the 50 best nonprofits to work for in the United States! We couldn’t agree more. At KaBOOM!, our motto is “serious fun.” Playgrounds don’t build themselves, and we have our work cut out for us to realize our ambitious vision of a great place to play within walking distance of every child in America. But in our offices, “work” and “fun” go hand in hand. Cool gear – All new Boomers are given a purple polo, a sweatshirt, a T-shirt and a backpack. Whether we’re building playground, going on a weekend hike or just heading to the office, we wear our gear with pride! Office space – Forget the drab grays and browns that define most office spaces. 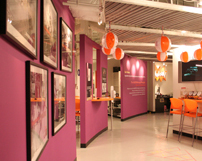 Our offices are painted in our signature colors—orange and purple—and the walls themselves are enough to brighten even the gloomiest of days. We adorn our workspaces with colorful name tags that we draw ourselves on chalkboards, and we hold meetings in conference rooms with names like “Sunny,” “Babble On” and “Play Pen.” Click here for an office tour. Play equipment – The first things to greet Washington, DC Boomers when they walk in the door each morning are a slide and a tire swing. Between our three offices, we also have Imagination Playground blocks, a foosball table, a ping pong table, kazoos and an abundance of arts and crafts materials. We all know children need to play, but that doesn’t mean that adults can’t play, too! Culture Captain – Just having play equipment doesn’t mean it always gets utilized, so each month, two Boomers in each office are designated as Culture Captains. The Culture Captains are charged with planning a fun team-building activity or event that everyone can participate in. Past events have included musical chairs, pumpkin decorating contests, scavenger hunts and costume contests. Click here for more Culture Captain photos. PB&J days – Because eating well and playing well are both essential to good health, each month, Boomers get a chance to take a break from their busy schedules and enjoy lunch together. The kitchen is turned into an a-la-carte deli with cheeses, meats, veggies, chips, salads and beverages set up for an elementary-school cafeteria feast! And of course, we don’t skimp on the PB&J—because there’s nothing like a good old-fashioned peanut butter and jelly sandwich to reawaken your inner child. Play Academy -- Each year all KaBOOM! staff from all three offices get together for a multi-day retreat, where we do a lot of learning, a lot of planning and a lot of playing! Past Play Academy activities have included creating our own board games, acting in “Boomerpiece Theater” and singing karaoke. Click here for more photos from our 2010 Play Academy! Sand – We not only take the time to appreciate and recognize other Boomers for a job well done—we do it playfully! When Boomers start at KaBOOM!, they get a sandbox bucket and a shovel notepad. The notepad is to write notes of appreciation for coworkers (called “giving sand”) and the sandbox is to collect notes from others. In 2006, an incredible 65% of Americans received no recognition in the workplace. Our deliberate sandbox practice ensures that 100% of Boomers are given credit where credit is due. Amazing coworkers – Not everyone has what it takes to be a Boomer. Our extensive, selective hiring process helps ensure that all Boomers have a “can do, will do” spirit and are always willing to go above and beyond the call of duty. While Boomers are an incredibly diverse bunch, we all share a commitment to service; a passion for children and communities; and an uncanny zest for life, work and play. Amazing volunteers – Of course, we couldn’t do what we do without our dedicated and spirited volunteers! Any Boomer can tell you how gratifying it is to help recruit a community member to our cause, unleash their creativity, and then step back and watch them blossom! There’s only so much that our 80+ Boomers can do, and our volunteers enable, amplify and support our efforts. Satisfaction of a job well done – At KaBOOM! we get results. Whether we’re calling clients, answering web queries or wielding a sledge hammer, all of us know that we are part of a collective effort with a measurable, positive impact on society. With nearly 1,750 playground builds under our belt, a vibrant and growing online community, and support from a long list of celebrities and sponsors, we can come to work each day knowing that we’re doing our part to strengthen communities and restore play in the lives of our nation’s children.